The Ratcliffe Hicks School of Agriculture (RHSA) offers 2-year Associate of Applied Science (AAS) degrees in Plant Science, and Animal Science. Plant Science majors may concentrate in Ornamental Horticulture, Turfgrass Management, or Sustainable Crop Production. 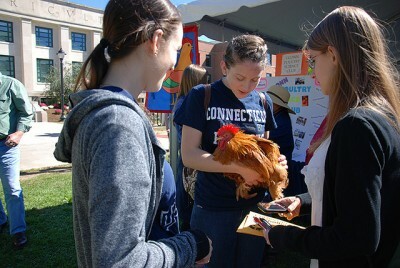 Animal Science majors may choose to focus on Equine Studies or Dairy/Livestock Management. The School provides an opportunity for students with a variety of educational backgrounds and experiences to further their education with an applied focus. RHSA students include recent high school graduates as well as adults who are interested in continuing their education or a career change. Coursework offers a balance between technical and theoretical aspects of animal science, horticulture, and related disciplines. RHSA courses are taught by faculty in the College of Agriculture, Health and Natural Resources. RHSA students also take classes with baccalaureate (4-year) degree-seeking students in CAHNR and other colleges within UConn. To view the recommended course sequences for each major, view the Animal Science or Plant Science pages. Information on major requirements may also be found on the Plans of Study page. Additional information about the Ratcliffe Hicks School of Agriculture may be found in the Undergraduate Catalog. RHSA students are considered UConn students, and have the opportunities and resources available to any other student at the University. One main difference is RHSA students may not compete on NCAA-sanctioned sports teams; however, there are many intramural and club athletics available. The Ratcliffe Hicks School of Agriculture is only available at the Storrs campus. RHSA students may choose to live on-campus in the residence halls with other UConn students. Commuting or living off-campus are also options, especially for those students who wish to enroll part-time. RHSA graduates have the skills and knowledge to enter many challenging and exciting careers. They are highly qualified for competitive positions and often own businesses or manage production operations. Plant Science majors pursue a wide array of careers in floriculture, landscape and grounds maintenance, greenhouse and garden center operation, nursery production, park and land management, or arboretums and botanic gardens. Animal Science majors find positions in the horse industry, production enterprises, animal health, breeding and genetics, nutrition, meat science and food handling, or related service industries. The College of Agriculture, Health and Natural Resources has a Career Consultant through the Center for Career Development that works with many Ratcliffe Hicks students on resumes, cover letters, internship searches, and job applications. Visit the Career Development page to learn more about the resources available to students in RHSA. Many RHSA graduates continue their education and pursue baccalaureate or higher degrees at UConn and elsewhere. RHSA students who successfully complete the program and graduate with a cumulative grade point average (GPA) of 2.7 or above are eligible to apply for transfer into the College of Agriculture, Health and Natural Resources for a baccalaureate (4-year) program. Please visit our 4-Year (BS/BA) Programs page for more information on the transfer procedure.